We have the latest and best standing desks available in the UK. 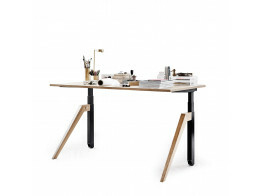 Apres Furniture supplies a range of modern electric height adjustable desks and manual crank handle adjustable desks which allow you to a stand up at your desk and work . We supply sit-stand desks so that users can alternate their position from sitting to standing while working. Studies have proven that alternating between standing and sitting at work has a positive effect on health and subsequently improves work rate and morale. Standing desks are also ideal for new employees as well providing hotdesking solutions due to their versatility. These adjustable sit-stand workstations offer a different way of working, accommodating users who may suffer from ailments such as cardiovascular and muscular-skeletal problems. Crank handle adjustable desks - or winding handle workstations - don’t use any electrification and tend to be more cost effective than motorised standing desks. Crank handle desks offer height adjustment ranges which generally start at 650mm and can go up to around 850mm high. Of course, they may not be suitable for everyone due to the manual operation involved. 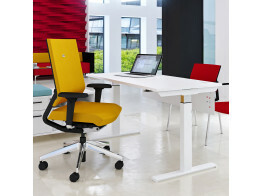 Electric standing desks feature the latest technology, such as silent motors, which have very little impact on noise in the office whilst they are in operation. Furthermore, electric adjustable desks have a larger height adjustment range: desks can be set at a standard height of 650mm, smoothly rising, by the press of button, right up to 1280mm. This means that even the tallest of workers can be accommodated. Many of the motorised standing desks we provide come with integrated keypads with LED display screens which represent selected height increments. There is also the option of specifying safety features like anti-collision, which ensures that any obstruction impeding the desk's movement downwards will be instantly recognised and the desk will automatically rise. Après Furniture can assist you with any questions you might have regarding ergonomic standing desks, such as anti-collision features, low standby power consumption, ease of use, maximum weight capacity, manual or electric operation and other functional accessories. Cabale Standing Desk is available as an electric or manual crank adjustable desk. 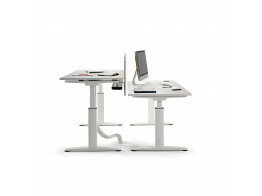 Tyde standing desk allows you to vary between a seated working position to a standing one. NoTable Standing Desk is a high quality sit-stand office workstation solution. Kyo Sit-Stand Executive Desk is an executive office adjustable height desk solution. 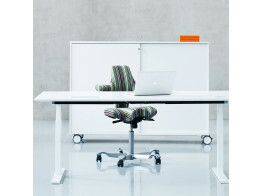 Attention T Height Adjustable Desks for modern offices with a electric height adjustment range of 650mm - 1250mm. Mobility Sit-Stand Desks with electric height adjustment range of 650 - 1290mm for ergonomic comfort. Manual version also available. 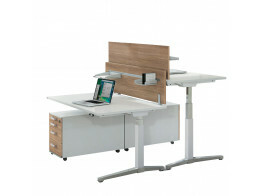 Canvaro electric height adjustable sit-stand office desks with optional memory setting. 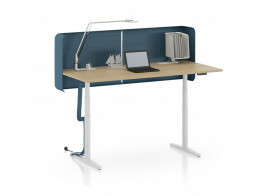 Progress gas strut or electric height adjustable office desk with an adjustment range of 685mm to 1185mm. Q20 height adjustable desk with electric sit stand adjustment from 610mm to 1260mm.